This article contains instructions for creating a preload (seed) data set for your Axcient BDR for ShadowProtect customers. If you have a large amount of data to initially backup to the Axcient cloud, you'll want to streamline this process by choosing the most efficient of our preload options. Review this knowledgebase article for a comprehensive description of all of your preload options. This will help you determine which of our preloading options works best for your situation. Review this article to estimate the time required for your preload: How long will my initial backup take? IMPORTANT: Password protection is required for your ShadowProtect backup images to be stored in the Axcient cloud. Axcient will reject any ShadowProtect backup images that are not protected with a password. If your backup images currently do not have password protection enabled, you must start a new backup chain using password protection before preloading. If the backup is not too large and your customer has sufficient bandwidth, simply use ImageManager, letting the backup replicate to the cloud storage node. Follow the standard ImageManager procedures (Create a New ShadowProtect Backup Job) and set the base image to upload along with the incrementals. All ImageManager installations should ideally be accompanied by a FTP client. Preload your backups to the replication target with a FTP client. Authenticate with the same username, password, host and port used in ImageManager to replicate data. c. Once you have connected to the server, select the new chain and drag it to the server side, to initiate the copy. The client allows for multiple files to be uploaded at the same time. You will get a pop up box to confirm the move and adjust settings, if needed. 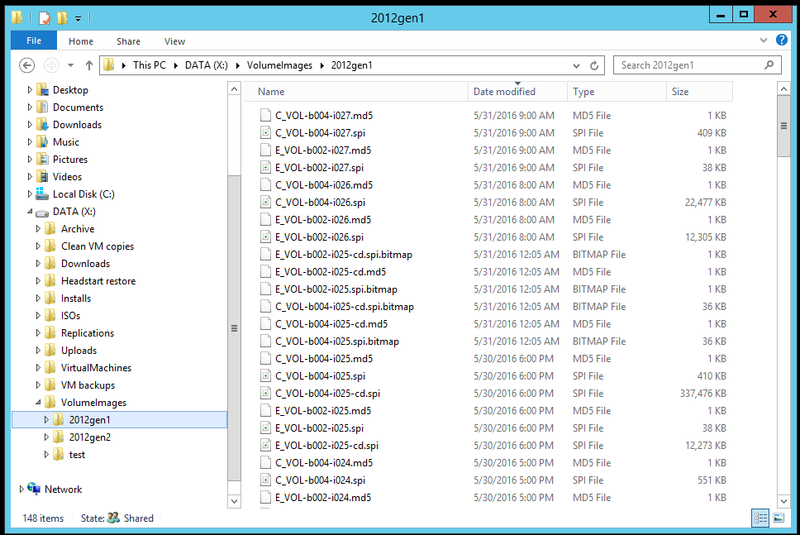 Copy the entire contents of the managed folder you wish to preload to an external USB drive or NAS. Carry the external USB drive or NAS, with the backups, to another location with sufficient bandwidth. Preload your backups to the replication target with a FTP client. Authenticate using the same username, password, host and port used in ImageManager to replicate data. You can login to the remote storage VM from any location. WebSeed is like the FTP client (you upload the data directly to Axcient’s servers) but you do not need a special client program installed to do it. Request a WebSeed account by providing our Support team with the email address associated with the desired account. (We recommend using a generic/shared email like support@yourcompany.com). You will also need to supply your vault URL, so we can ensure that your account is put in the right data center. Note: If you have vaults in more than one data center, you will have a Webseed account for each data center. (The username and passwords can be the same.) Be sure you upload the data to the correct data center. b.) Upload your data to the WebSeed server. Click here for more instructions on doing this. Our Support team will then move the data onto your vault. With this option, we ship an Axcient -supplied USB hard drive to you. You then copy your data set to the drive and physically return it to our data center. If you are ready to request your preload drive now, do so here: Request a Preload (Seed) Drive. Once you have received the hard drive, you’ll create a folder for each customer, using each customer’s unique account number from the Partner Portal. You’ll then copy the folder (with the chain or chains you wish to send to us) to the folder with the account number. IMPORTANT: Preload drives can only be requested for shipment within the United States. If you are outside of the US (Canada, EMEA), please refer to our knowledge base for instructions on how to preload your data. • If you are using an FTP upload, use the FTP client which manages the customer’s cloud data. We recommend WinSCP. • If you are using an Axcient -supplied USB hard drive, follow the shipping instructions you received from us in the shipment tracking email. If you have any problems during this procedure or have questions, please go to https://axcient.com/partner-support and contact our support team before sending us your preload.